Welcome to the Colorful world of African Cichlid Fish. 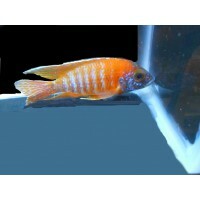 CAS is your #1 source for high-quality African Cichlid fish at reasonable prices. We not only sell these fish, we try to advise our customers, on our forum, on which fish work best together and how best to keep these fish. We take pride in our customer service and do everything we can to make your fish purchase enjoyable. The best way to contact us for Customer Service is by email at Support@CichlidsAreSpecial.com. Check us out and like us on Facebook at www.Facebook.com/CichlidsAreSpecial/. Spread the word about our fish to your friends that keep fish. ATTENTION: We do NOT operate a physical store location, but we do offer local pickups at a nearby location by appointment only. We carry primarily community tank African Cichlids that can be mixed together to produce an extremely colorful tank. Please visit our compatibility chart for more information about mixing these type fish in a community tank. GOAL: To carry, maintain, and sell one of the largest variety of high-quality African Cichlid Community Tank fish stock available in the Mid-Atlantic Region at reasonably affordable prices. MISSION: To provide quality African Cichlid Fish and a few other types of Aquarium fish to the hobbyist at a fair price and with excellent customer service.